I have been using Microsoft Office 2007 since last one and half years and frankly speaking “I’m lovin’ it”. Be it quick style feature of Word 2007 or ShapeStyle, WordArt Style of Powerpoint 2007, I have been using them extensively in this period. The new interface is so usable at the same time providing me lots of, out of the box available formatting features like table style, document templates n so on. Ok so enough of praises for Office 2007, after all this post is not about why I like it. There are plethora of resources, posts, videos available over net describing the above mention benefits (features) of office 2007. This post is about creating and publishing a blog entry right from Word 2007 document. Since last few days I have been trying to be little active with my blog and write something to do justice with the its tagline “What I learned today“. 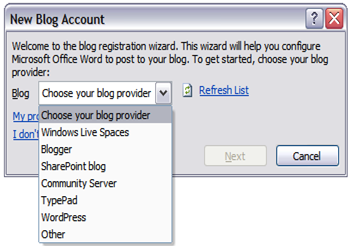 Last week I was reading Gaurav’s blog and there he had a post about blogging from Word itself. So far I have been using Windows Live Writer to do most of my blogging related stuff(which is minimal BTW J), which is a great tool for blogging but it didn’t allowed me to format my post the way I wanted them to for ex putting quotes, creating colored tables for comparison related stuff etc. After reading gaurav’s post, I myself thought to give a spin to this feature of publishing content from word. So here is the post for my tryst with blogging in Word 2007. Go to Office Button in word and then select Blog option for Publish menu item. 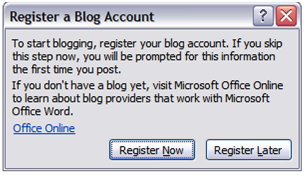 This would ask you to register a blog account with MS Word. Register your blog by providing the details about your blog as shown in below screenshots. After registering the blog a new word document will open and you are good to go. I tried various formatting setting, picture formatting. So far so good. I am going to use word now instead of Livewriter. This entry was posted on September 22, 2009 at 11:24 am	and is filed under Microsoft Word 2007, Non Technical. Tagged: blog, blogging from word 2007, office 2007. You can follow any responses to this entry through the RSS 2.0 feed. You can leave a response, or trackback from your own site. For more helpful tips, tricks, and resources, check out the Office page on Facebook: http://www.facebook.com/office. great..thanks for high lighting such a features of word.. i will definatly try office 2007 for blogging..
Hi Manoj. Since you have been using it successfully, I wonder if you can help me. I am on Windows 7, using MS Office Word 2007. 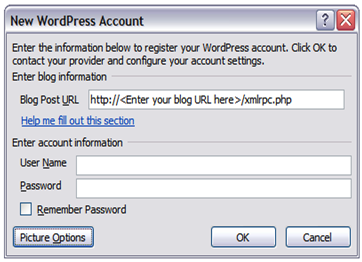 I have a client who wants to blog from his MS Word 2010/PC system and publish his posts to a self-hosted WordPress blog. I have tried to set him up to do so, but am getting the same problem on both his system and mine; when I publish a post, it shows up in the blog with extraneous characters (p’s, to be specific) and the images are not showing up at all. Have you or anyone else had a similar experience? Does anyone know what is going wrong here? Thank you for any help you can offer me.